Have you fleshed out an outline for your nonfiction book? Carved out your ideal writing spot? Set a regular time in your calendar for writing sessions? Have you wrapped up your research? Examined the competitive landscape? Gotten uber clear on your vision for your book? Congratulations! You’re ready to write. And, you probably already know this, but the actual writing of a book can be difficult. Distractions are everywhere. Insecurity tends to creep in at the most inopportune times. Progress can be slow. But what I know for certain is that if you commit to chipping away at your book, word-by-word, page-by-page, you will reach your goal of a completed manuscript. I promise. And to help you along in this endeavor, I thought I’d share with you my best tips for setting yourself up for a successful book writing process (or any worthy goal for that matter). 1. Keep your book writing raw materials gathered and/or organized so when you do have time to write, you don’t waste time pulling what you need. 2. Take advantage of short windows of free time to write—short writing bursts add up to serious content. 3. Be vigilant about protecting time you’ve allocated for writing. 4. Set realistic, doable mini writing goals that will keep you moving forward, and stick to them. 5. Make your writing sessions enjoyable—grab a cozy throw, put on a pot of your favorite tea, head out to your favorite café. Do what you can to create a sense of joy around your writing. 6. Tell friends and family when you’re going into your writing zone so they respect your creative space and avoid interruptions. 8. Before you begin writing, take care of your needs—use the toilet, grab a snack and a glass of water, find your slippers. If you’re prone to procrastination, every unmet need while writing is apt to become a source of delay. 10. 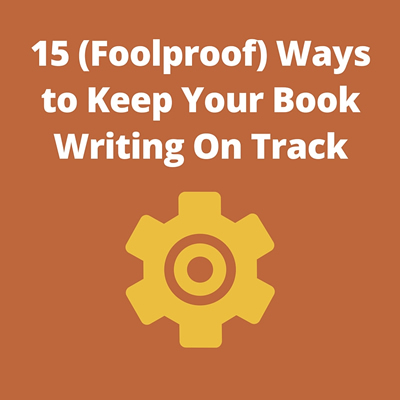 Find creative and effective ways to build accountability into your writing process. 12. Create realistic deadlines where there are none. And stick to them. 13. Practice extra self-care when in writing mode. Your brain (and body) will thank you for giving it some extra TLC, including naps, exercise, healthy eating, and downtime with friends and family. 14. Be flexible (and forgiving) with yourself. If you don’t reach a writing goal or hit your weekly word count, that’s okay. Set a new goal and keep moving forward. 15. DON’T FORGET TO SLOW DOWN AND ENJOY THE PROCESS! The writing of the book is (imho) the most rewarding and creative part of the entire publishing journey (even when it feels impossible and messy). Click here to download a mini-poster of these successful writing strategy tips. In my next post, we’ll tackle writing the crappy first draft.